ECHINODERMATA : DENDROCHIROTIDA : Cucumariidae STARFISH, SEA URCHINS, ETC. 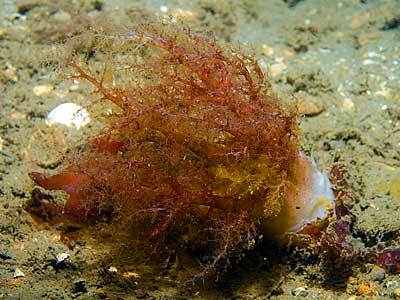 Description: This sea cucumber extends its large red tentacles from muddy sediments. 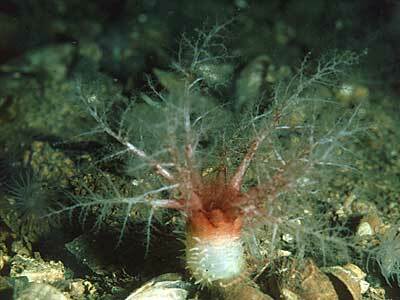 The tentacles are finely branched and may be dark red or lighter pink in colour, becoming white at the tips. The body is white and thick-skinned, covered all over with tube-feet. There are two rings of tentacles; an outer ring of five pairs of large ones and an inner ring of five pairs of small ones. Spicules are absent except in the introvert and tentacles. The ones in the introvert are tables with a perforated disc and delicate spire. Up to 25 cm in length. Habitat: Lives buried in mud usually in sheltered sites and deeper than 20m. Associated with horse mussel beds in Strangford Lough. Distribution: Recorded from all round the British Isles. Frequent in sea lochs and sheltered sites in W. Scotland. Similar Species: Thyonidium hyalinum (Fleming, 1828) is similar but smaller with a more transparent skin and spicules with a shorter spire. Red bushy tentacles emerging from mud. 20 paired tentacles in two sizes. Tube feet all over white body. Picton, B.E. & Morrow, C.C. (2016). Thyonidium drummondii (Thompson, 1840). [In] Encyclopedia of Marine Life of Britain and Ireland.